I tried to keep up with Folstad on a recent delivery, but as you can see in the video on the website, it was futile. He did, however, slow down enough to discuss the hyper-local, sustainable and increasingly tech-savvy world of bike delivery.If you want to keep up with Sean Folstad, the founder of bicycle-delivery company Zen Delivery, don’t bother. The man is a biking machine with a pair of quads suitable for the Tour de France. But while he might not be your best companion for a leisurely ride around Minneapolis, he is the man to call when you want lunch. Folstad founded Zen Delivery in 2015 after he and his other bike-courier friends saw similar services pop up on the other side of town. He thought the growing hip neighborhood of Northeast Minneapolis needed its own. So they just started biking, bringing everything from cigarettes, beer and (as I saw first hand) bathroom tile. But mostly, they worked with restaurants to provide delivery on demand and enjoyed the range of adventures biking year round in Minneapolis offers, like the deluge that hit the day before. The company survives on a flat delivery fee plus a percentage of the order price. They can keep prices low because there’s no fleet of cars, no car insurance and no gas. Riders also prefer fixed-gear and single-speed bikes to avoid all but nominal maintenance. Tips are encouraged to keep the bikers fed for the many miles they ride each shift. Even when subsidizing the fee, it ‘s lower than the typical 20 percent that national outfits charge a restaurant. That’s an obvious advantage to bikes, and customers like the low environmental impact. Speed, of course, is key. The quads helped on that front. One thing Zen Delivery didn’t start with was the digital prowess of bigger delivery brands. Ultimately, Folstad did it himself. “We tried to go through it with developers, but that can be exorbitantly expensive, so I have some experience with graphic design, so I started there and the rest was just learning it,” said Folstad. It was clear that customers were used to digital ordering from the big players, so they added an app to compete. In 2016, Folstad said the company completed just under 5,000 deliveries, but with the new app, he said it’s on track to reach 15,000 to 20,000 with an average of 30 to 40 orders a day. Riding isn’t. however. 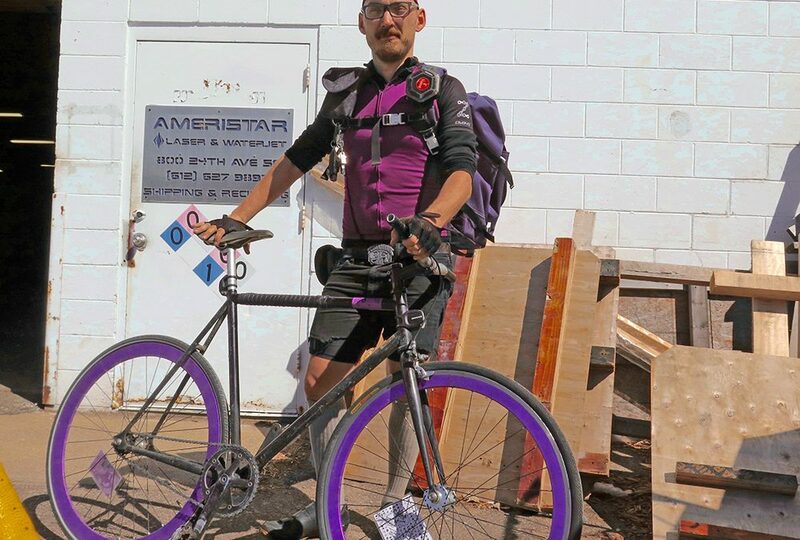 for the faint of heart (or out of shape), the crew at Zen Delivery bikes between 30 and 60 miles each shift for hundreds of miles a week, and you better know how to change a flat fast. But given the speed he and his fellow riders travel, there have only been two bad crashes since 2015.